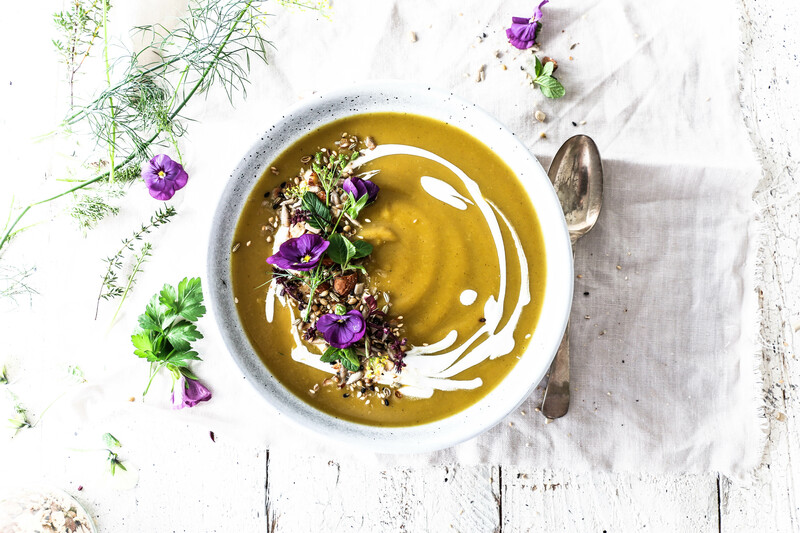 Being the middle of winter in New Zealand, our dinner menu has turned to lots of warming, nourishing meals, and the simplest form that takes is soup! Soup can be very easy and quick to make, and the leftovers make for the best lunch the next day. I’ve posted quite a few soups over the last couple of years, like this ever popular coconut cashew soup, this spiced coconut & kumara chicken soup and even a Vietnamese inspired pho with zoodles. I’ve also ventured into soups with toppings like this green soup with adzuki bean topping and this carrot, pumpkin & turmeric with spicy black bean topping. However, I realised I’ve yet to share a completely blended, super creamy, vegetable based soup. No doubt because I’m all about minimising time in the kitchen, so if I can get away without blending a soup then that’s how it’s going to be served! 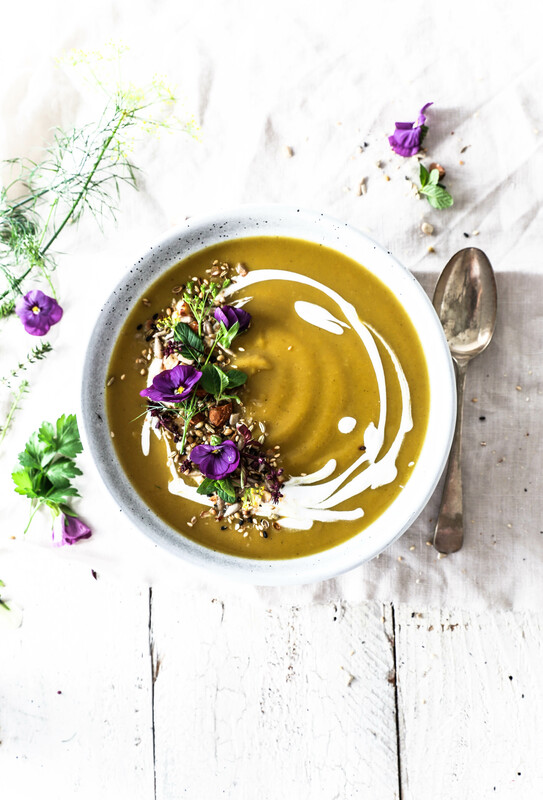 This spiced broccoflower, parsnip and sweet potato soup simply begs to be blended, and the result is the creamiest, smoothest vegetable soup, that puts it into a whole other soup galaxy! To keep things simple, this soup starts off with a broth base – either vegetable or chicken – up to you. Next add onion, garlic and ginger, followed by vegetables, and allow it to simmer until the vegetables are softened. At this point it’s best to blend it, i.e. before adding any spices, because if you DON’T WANT TO TURN YOUR BLENDER JUG YELLOW, it’s best the turmeric stays out until after you’ve blended it!! If you throw caution to the wind and do it anyway, a turmeric stained jug can be reversed by leaving it in the sun where the UV rays will naturally turn it back to it’s original colour (though mine still isn’t quite the same). To finish this soup off and bring all the flavours together add either coconut milk or cream – whichever you have to hand, and for those of you who feel some extra protein is required, you can either add a cup of firm tofu cubes, or finely sliced chicken breast. As for toppings, here you can go crazy, if you want to! I love to start my toppings with a good swirl of coconut yoghurt. If your coconut yoghurt is too thick to swirl, a good tip to thin it out is to stir in a little coconut milk until you have a pourable consistency. From there, I like to sprinkle over some almond dukkah and finish off with some pretty edible flowers. But if you want a more substantial topping, feel free to whip up one of the soup toppings like the adzuki or black bean I linked to above, or simply throw anything else on top that you think would suit. Micro greens are beautiful as is a large handful of watercress. Enjoy! To make the soup, place the broth, water, onion and garlic into a large pan set over medium heat. While the soup base is heating up prepare the rest of the vegetables. Peel and chop the sweet potato and parsnip into bite size pieces and add to the soup. Wash the broccoflower well, chop into florets and add to the soup. Season well with salt and pepper. When the sweet potato is cooked through (test by cutting a piece with a butter knife and it should slide through easily), turn off the heat and blend using a stick blender or a Vitamix style jug blender. Return the blended soup to the pot, add the remaining spices followed by the coconut milk or cream and heat until it just starts to simmer again. At this point the soup is ready to be served. If you wish to add tofu, simply add the cubes and allow them to heat through. If you wish to add chicken breast, slice it thinly and add to the soup. Allow the soup to gently simmer until the chicken is cooked through. Serve with your choice of soup toppings from the list above. 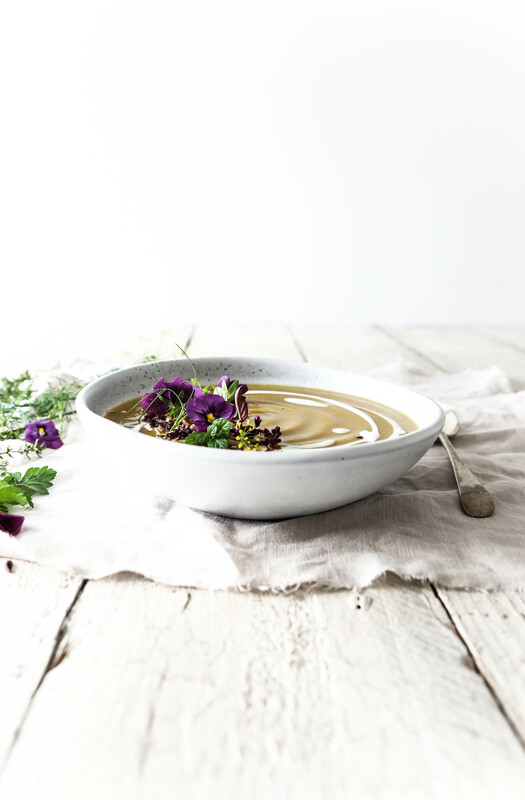 This spiced broccoflower, parsnip & sweet potato soup will keep well in a sealed container in the fridge for approximately a week, and will freeze for up to 3 months.